I honestly and truly have no idea where to start. The characters? The world building? The flowing dialogue? The imagery in every detail? Yes readers, this is one of those books, which means it will be one of those reviews. So sit back and relax… this may take a while. *sigh*I honestly can’t remember the last time that not only a book, but the characters within that book grabbed me the way this one did. There’s no other way to describe them but real. Zoe was a character I could relate to from the beginning. There was nothing fake about her. She was totally sincere in everything she did and I loved her for that. She was feisty and may not have always stood up for herself, but she had no problem standing up for both people and causes she believed in. Then there was Gavin… beautiful, broken Gavin. He was totally ready to sacrifice everything for those he loved. He was rough around the edges but just as strong when it came to defending others as Zoe. Together these two were prefect. There was just the tiny little matter of them only being together in their dreams… literally.So, Gavin and Zoe were the main characters, but the supporting cast was not only strong, but just as important to the story. The crew that supported Zoe, especially her best friend Adriene, were great. I loved Adreine’s wit, her brassiness and her obvious love for Zoe. As best friends go, she was, well, the best. Gavin had his band mates, but we didn’t get to know them very well. The main friend that we met of Gavin’s was Yileen. But he was way more than that. He was his mentor, his protector and one of the few people he trusted totally. I loved Yileen. He was wise and he had more than a few tricks up his sleeve. Then there were the bad guys and no one was badder than Scarlet. She is the kind of character that you not only love to hate but a character that you wish would go up in flames. (And yes, I do realize how truly ironic that statement was…) Sinnder is also among the bad guys, but the jury’s still out on him as far as I’m concerned. I think that there is much more to his character and I’m sure we will find out what secrets he’s hiding as the Trilogy progresses.Did I mention that the world building was a phenomenal part of Inhale? It’s complicated, intricate, beautiful and amazing. Yep, that pretty much sums it up. I love the concept of the Dreaming. I found out after I finished the book that there is a glossary of terms in the back. When you pick up Inhale… and you MUST pick up this book… don’t be afraid to glance at the back to find the glossary. I had no problem following the terms and mythology but it might be easier with the background that the glossary provides.So basically, there you have it. Inhale was so much more than I expected and then some. 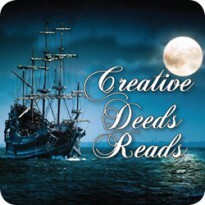 The writing was almost lyrical and the story had me totally enamored from the first chapter. The world building was amazing and the romance was hot. There were tears, laughs and a fair amount of anger thrown in for good measure. You might even learn something about whales, which was an added bonus. 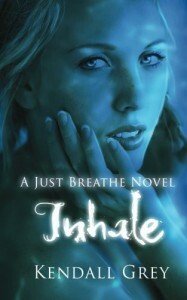 Having said all that, Inhale is also not a book for the faint of heart. The warning that comes with this one is for real so pay attention to it. Kendall Grey held nothing back, which I found amazing but some readers may not.The next book in the trilogy is Exhale and I will be picking it up soon. I am now totally hooked and even though Inhale didn’t end in a true cliff hanger, there is definitely much more to come and I can’t wait to see where these characters are headed next.